Amazing assortment of vivid colors such as blue, purple, yellow, white and orange. Including beautiful bi-colored flowers, with different colored faces. Purple with yellow and blue hues are especially beautiful. Mild taste with a hint of tartness. Fantastic on cheesecakes, cupcakes, appetizers and salads. Float on drinks for an upscale finishing touch! 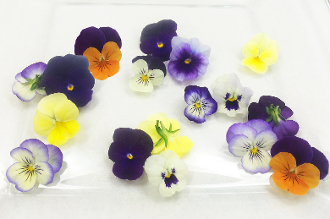 These are basically small versions of Pansies. These are about 2" in length and have flat, thin petals.